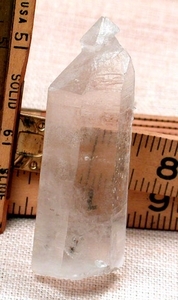 Reverse scepter crystals are extremely rare in Arkansas - that this crystal has a beta quartz crystal as its' topper makes it beyond even that. Beta quartz crystals form as bi-pyramidal crystals, which is to say they are two sets of terminations without any prism sides at all. Self-displaying at 7/8x 2 1/2" tall, you'll be able to read through it from every prism side despite its' titanium overlay. You will also be able to see its' beta top, rollercoaster of a veil, hera bottom, and raised record keepers clearly. We do suggest a loupe for the 1/4x 1/4" many pointed, dendritic included cluster at its' side, and for the two rear faces in regrowth with a fine iris. Finely ribbed sides give you a better grip to examine it with. Sent gift boxed with hand written description.